Are you planning to paint today? You may have a million ideas running through your head about what to paint but when it comes to deciding on what medium you will paint, it becomes a difficult ordeal. Should you be using a blank pre stretched canvas or go for a stretched canvas? The decision may be easy for some to make, but many find themselves in trouble when they are faced with such a situation. If you are facing the same issue, we would love to help you out by providing you with your decision making process. If you are one of the people that have to stretch their own canvas and find no strength to do it, the best option for you would be getting a blank canvas that has been pre stretched. This will help you make the process easy and fast and you can directly move to the final work not worrying about stretching the canvas. And, if you are the kind of person who loves to stretch their canvas, then you should be opting for blank stretched canvas for your paintings and it will work wonders for you. The choice of canvas depends on the requirement of the artist. There are several factors you need to take into account before making the decision about the medium you want to use to convey your imagination and thoughts onto a piece of canvas. Do you have an idea in mind that you want to paint on canvas but the ordinary sized canvas will not be suitable for it? You need to get your hands on large stretched canvas blank or large pre stretched canvas custom made to your individual needs. We, at CanvasChamp, offer artist canvas that can be customized as per your needs. With us, you will get exactly the size you desire for your painting. We guarantee that our products are highly durable and made with the best quality materials. If you are looking for the finest quality art canvas for sale either pre stretched or stretched, you will get no better deals anywhere eels than at CanvasChamp. We offer blank stretched canvas wholesale prices and ensure that you get nothing short of the highest quality products. We value art and artists and thus make sure that the artists out there get the best products to display their creativity and imagination. Order your artist canvas with us today get the best deals. What will you paint today? Even though you might have plenty of ideas circulating in your head, you know you will run into a problem when it comes time to decide on the type of canvas you want to select to display your artistic genius to your peers. Will you be using a stretched or blank pre-stretched canvas? The decision is a tough one, but one that we are sure you can easily make. If you cannot, we would love to assist your decision making process, helping you choose blank pre-stretched canvas. If you do not have the strength or need to stretch your own canvas, you should choose pre-stretched canvas where the work is done for you. For those who love to stretch their own canvas, then a stretch canvas will work wonders for them. Although both are popular amongst artists, but the type of canvas an artist settles on using is one that will suit their requirements. In fact, there are several factors that artists look at before they make up their mind about the medium they will be using to convey their thoughts and imagination. An artist interested in purchasing a stretched canvas will have to get stretcher bars; whereas, they will need a painting rack if they purchase a pre-stretched canvas. Stretching your own canvas is not an easy task and a tough one to master on the first. Hence, beginners should stick with a pre-stretched canvas than the other one. 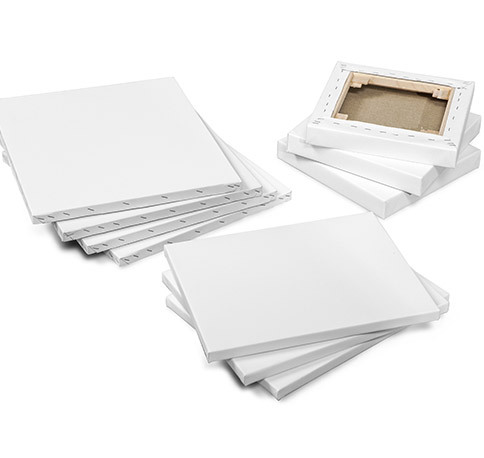 Stretched canvas and blank pre-stretched canvas are widely used by artists worldwide. Artists have to look at a variety of different factors before they begin to convert their thoughts into reality. They need to look at the length of the canvas, its thickness, and if they would be comfortable stretching their canvas or buying a pre-stretched one. 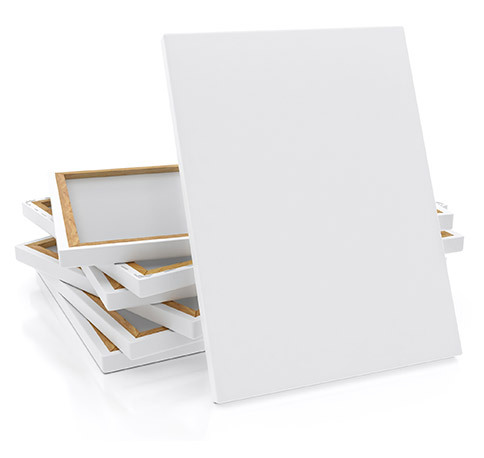 Our pre-stretched canvas are made from kiln pine wood, have a 38 mm thick frame, triple primed, are 10 oz gallery wrapped, and vary in length. 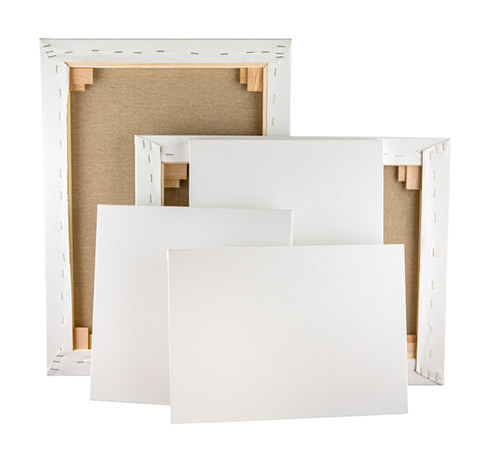 Our stretched canvas are made from cotton or linen and their thickness range from in 3/4"–7/8, 1-1/2, to 2" and thicker. Bear in mind that stretching a canvas requires hard work, and if you have never stretched a canvas before, you will find it difficult at first, but with experience, you will learn. For now, you can opt for a pre-stretched canvas if you do not want to attempt stretching it. However, mastering the skill to stretch a canvas will come in handy in the future, as you will able to select the surface, size, brand, texture, and quality of the canvas. Regardless of which one you decide to purchase, we have both available in stock. 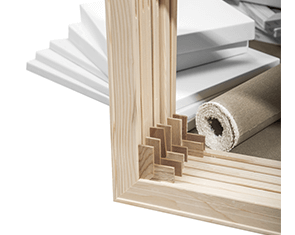 The pre-stretched canvas is made using kiln pine wood, adding to its durability. It comes with a 38 mm thick frame, is triple primed, is stapled in the back (10 oz canvas gallery wrap), and the length ranges from 8 x 10 to 48 x 48. The stretched canvas is manufactured from cotton and its thickness ranges from 3/4"–7/8, 1-1/2, to 2" and thicker. Ask about Blank Pre-Stretched Canvas and get answer in email. *What do you want to know about Blank Pre-Stretched Canvas? Q: What is the canvas material which comes in a pre - stretched blank canvas? A: It’s a 10 Oz Canvas Gallery Wrapped ( Back Stapled) On kiln dried Pine wood of 38 mm thick frame.